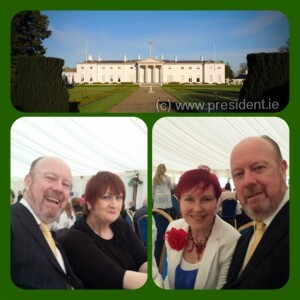 ReActors Ann Russell and Nuala Kelly (both photographed here with Pat Nolan) on a visit to Áras an Uachtaráin earlier this year 2015. They were there to celebrate Bloomsday and also the Birthday of the late Deirdre O'Connell. ReActor Ann Russell will take to the stage at The New Theatre in The Puffin's Nest, written and directed by Oliver McQuillan from the 12th-24th January @ 7.30pm.